The biggest reform to Victorian Planning Schemes in over 20 years! Victoria's Planning Minister, The Hon Richard Wynne MP gazetted Amendment VC148 to introduce a suite of changes to the Victoria Planning Provisions (VPPs). Tract is proud to have assisted DELWP in these transformative changes to Victoria’s statutory planning landscape. These changes are a result of the State Government's Smart Planning Reform Program, a long term project to simplify and modernise planning in Victoria, making it more efficient, accessible and transparent. Full implementation of the reforms is expected to generate over 500 jobs and produce savings to industry of $35 million per annum. VC148 is the third and largest amendment to the VPP since Smart Planning began in 2016. Tract welcomes these much needed changes to our planning system, which recognise increasing demands from a growing population and planning schemes that have grown considerably in size and complexity. VC148 is a foundational amendment that prepares the system for future digitisation which will deliver a step change in transparency, accessibility, and efficiency. Benefits will accrue over time as it puts into place the foundations for improving the drafting and quality of planning schemes. 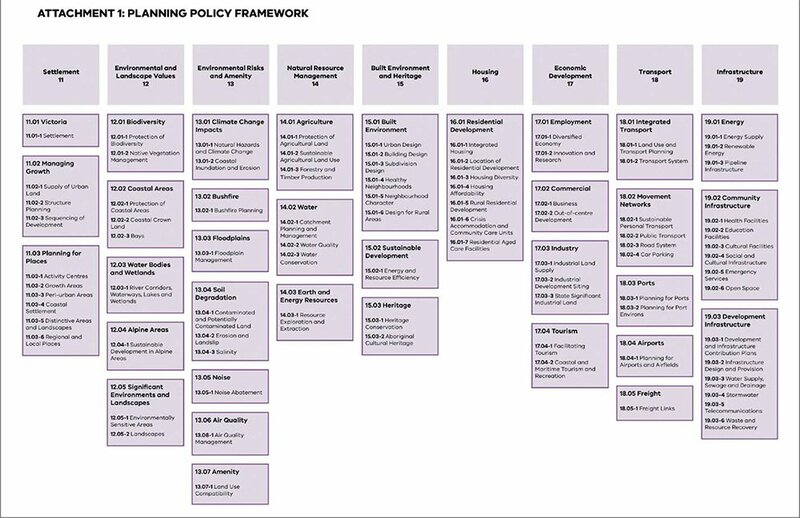 The most significant structural change involves combining State Planning Policy Framework (SPPF) and Local Planning Policy Framework (LPPF) into the new Planning Policy Framework (PPF) and creating a Municipal Planning Strategy (MPS) (to replace the current Municipal Strategic Statement (MSS). Integrating state, regional and local policy, this new 3-tier structure will better align Local with State policy and remove duplication, conflict and provide greater clarity to users. VC148 introduces the state and regional provisions of the PPF with local provisions being transitioned over the coming year. Obtaining a permit for car parking reductions can be costly, time consuming and act to limit the revitalisation of shopping strips. Clause 56.02 (Car Parking) has been revised to reduce car parking requirements for new uses of existing buildings in commercial areas and for land within walking distance (400m) of the Principal Public Transport Network (PPTN). A permit is no longer required to reduce the required number of car parking spaces for a new use of an existing building provided certain requirements are met. In addition, the reduced parking rates specified in 'Column B of Table 1' now automatically apply if any part of the land is within the PPTN area as shown on the Principal Public Transport Network Area Maps (available on VicPlan). For residential development, this means no visitor parking, and for most other uses a reduction in parking ranging from 15 - 65%. The VPP has been restructured to make it more user friendly and prepare it for future digitisation. This involves removing redundant provisions, consolidating operational and administrative provisions, and integrating VicSmart into the relevant Zones, Overlays and Particular Provisions. It also involves restructuring the Particular Provisions to group them into logical categories and make permit triggers easier to locate. Whilst some clauses have been renamed and renumbered, most have not. 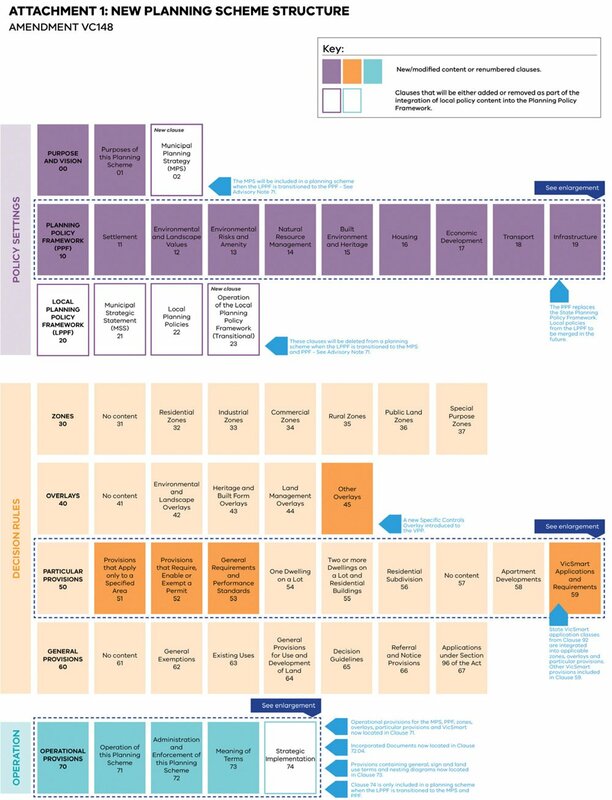 To assist users in learning the new structure, an online 'Clause Finder Tool' has been launched. An overview of the new VPP structure is found below. • Convenience shop in an Industrial 1 Zone. • Take away food premises in an Industrial 1 and 3 Zone. • Service industry in an Industrial 3 Zone (subject to conditions). These are in addition to the permit exemptions introduced as part of the second Smart Planning amendment (VC142), which will result in approximately 3000 less applications a year. • Amending specific zones, overlays and particular provisions to improve their structure and operation, and to support the future transition to the PPF and the integration of VicSmart throughout the scheme. • Introducing a new Specific Controls Overlay to replace the old Clause 52.03 (Specific Sites and Exclusions). This will work in the same way, and ultimately replace, Clause 52.03, and ensure site specific planning controls are mapped, thereby increasing transparency. • Deleting outdated particular provisions, including for a Service Station, Car Wash, and Motor Vehicle, Boat, and Caravan Sales. • Changes to Clause 43.01 (Heritage Overlay) to mandate a statement of significance for any added heritage place. This will bring about improvements in transparency and discoverability. • Applications under Clause 52.29 (Land Adjacent to a Road Zone) are now exempt from notice and review. • Phasing out the Priority Development Zone (PDZ). • Making alterations to Clause 52.05 - Signs to provide clarification and greater guidance for sign applications. In addition to VC148, a new online resource library has been launched offering free and convenient access to important planning documents, including (over time) incorporated documents, background documents, approved development plans and the like. Ultimately, links from planning schemes will be provided making the discovery of documents far easier for all users. Next month, a new Victorian Planning Schemes: A Practitioner Guide will be released that will improve planning scheme drafting, set out clear rules to guide practitioners, and bring about a more consistent approach to the application of the VPP. This will, over time, make planning schemes, including local schedules, clearer, more effective, and less prone to dispute. What Happens To My Current Planning Application? Tract’s expert planners have reviewed the changes in relation to our client's projects to understand the implications. Some applications, or parts of the application, may now be exempt from a planning permit and a full or partial refund of the application fee may be given. Other applications may be simplified. There are no transition provisions as most applications are not disadvantaged by the Amendment. If you would like more information about these changes, please contact your existing Tract contact, or reception on 03 9429 6133.